Mondays tend to be either field trip or home days for us, and today was a home day. I bought a bunch of activity books some time ago, and today we opened up Insects and Bugs and used the first page: butterflies, for a theme. We read the very limited text on the pages, and matched up the blank spaces to the butterfly stickers, which Ameli matched up pretty quickly and easily. We discussed how, just as we are ‘people’, but have different colours, hair, and faces between races, butterflies are a ‘species’ and have different wings and names, but similarities within their own types. We recognised the ‘Monarch’ and ‘Swallowtail’ butterflies, and just spoke about the patterns on the others. I then drew a picture of a butterfly, which Ameli coloured, and used some of the left over stickers , the extras, to decorate the butterfly. We still wanted some more crafts, so I cut butterfly wings out of cardboard, and cut holes to make shapes. 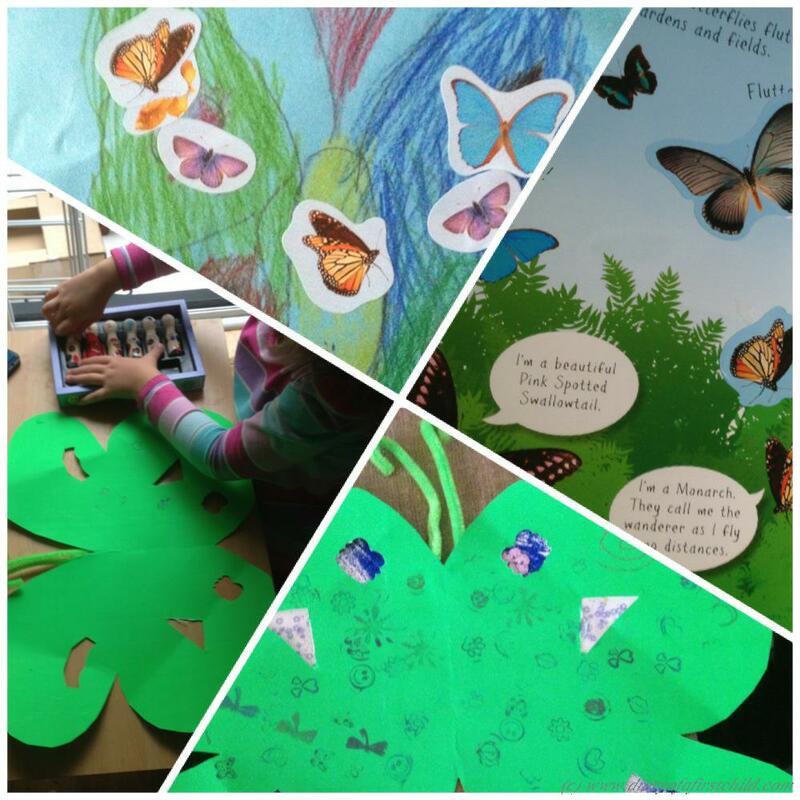 We decorated scraps of paper with glitter and glued them to the back of the butterfly, so the ‘holes’ shone through sparkly – Ameli loved that. Next, she coloured, stamped and decorated the butterfly. Finally, we watched a video on youtube about the life cycle of a butterfly, starting at the caterpillar, moving to pupa and finally emerging as a butterfly. 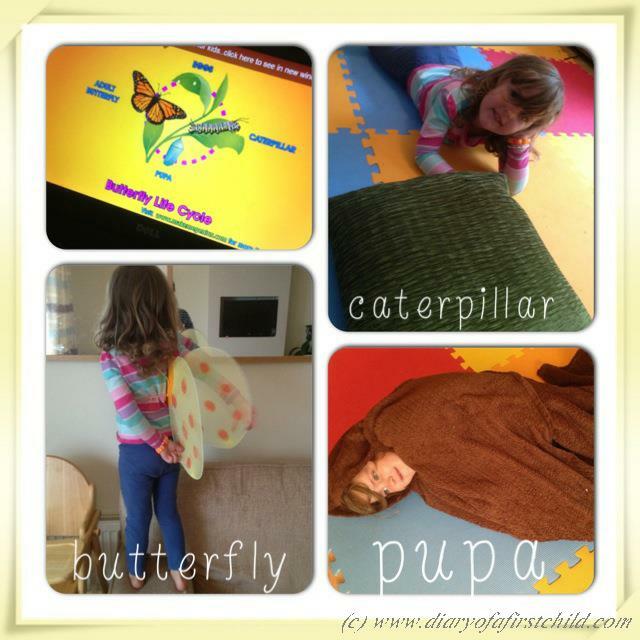 Ameli role-played the life-cycle, by crawling around the floor and ‘eating’ a (green) cushion (leaf) then rolling up in a blanket (pupa) before emerging as a beautiful butterfly. Aviya enjoyed the pupa stage, but didn’t really get the rest of it! I wanted to end the day watching A Bug’s Life, but couldn’t find the DVD. It was good fun, anyway, dong arty crafty stuff and throwing in a little learning too! My son is learning about butterflies at the moment with his child minder. they have got a butterfly garden and are watching caterpillars turn into butterflies. I think it is a lovely thing for them to learn about. I agree! I was thinking of buying a butterfly/caterpillar set, but I might give it a year!